I love eating pretty things, don't you? I naturally gravitate towards colorful packaging or decor (just how you were drawn to the colorful words on this page, am I right? :). I would like to submit an alternative to colorful, sugary non-goodness stuff with this Big Pink Smoothie. This pretty smoothie has many powerful antioxidants, fiber, essential minerals, vitamins galore, protein, and essential fatty acids. I bet you would never hear those claims from Skittles©! You may notice a rather strange smoothie ingredient in this recipe: a beet. Don't worry, your smoothie won't taste like a vegetable (but I bet my colorful spelling out of it made you at least think it might taste yummy, right? OK, I digress with the color :). If you are nervous about trying a vegetable with your smoothie in the morning start out small. You don't have to add the whole amount listed the first time you make it- just give a little a try. Beets have many amazing health benefits, and are actually a sweet veg. (There is even a type of beet that is used to make some commercially manufactured sugar.) Beets are a unique source of phytonutrients called betalains, which have been shown to provide antioxidant, anti-inflammatory, and detoxification support. These earthy guys are also high in dietary fiber and even show promise in lab tests of having anti-cancer benefits for certain cancers. If you are making this for one, you will need a BIG glass, my big glasses were all in the dishwasher this morning, so I went back for seconds with my 16 oz. glass. *Note- if you are watching for hidden sugar, read the ingredients of your vanilla. Many artificial vanillas have sugar added, and/ or sugar alcohols. Tip: if you only have a normal blender, try steaming the beets the night before for 15-20 minutes and then refrigerating them for the following day. This way they will puree easier in a lowered powered blender or food processor. Whether you are doing the Sugar Free Challenge or just want a healthier treat, check out my new tab above for "Sweetener Free Sweets". I will be adding to this tab soon with more goodies in the next 10 days. If you have decided you need to take the plunge and give up sugar for 10 days (starting tomorrow) then head on over to Spoon Full of Sugar Free and sign up! I'm so excited to be a part of this little community of people taking part in this challenge for the next ten days. I'm a bit behind! 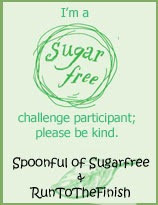 If you haven't already heard, there is a special challenge I recently found at the blog Spoon Full of Sugar Free. This great challenge begins this Wednesday (June 1st). It's only 10 days of giving up sugar. Totally doable! You give your gut a rest (much needed in our culture from time to time). You cut off the food supply of harmful bacteria and yeast to have them die off. You can have decreased headaches, more energy, decreased future sugar cravings, weight loss- primarily fat- and so much more! Refined sugars- white table sugar, beet sugar (yes still refined even though it has the word "beet" in it :), cane sugar, etc. Sugar substitutes- asperatame, splenda, and yes, even stevia! For more on how stevia messes with your sugar cravings see my post on natural sweeteners. Fruit juice- many things - like jellies and jams- are fruit juice sweetened. Check your ingredient labels! Whole fruits- The first couple of days, you may want to have a banana, a mango, pineapple, or a coconut around to satisfy sugar cravings. Try not to eat 5 bananas each day- then you really aren't doing much good :) I would try to limit myself to 3-4 whole fruits each day (or for berries, a cup is considered 1 "fruit"). Sweet vegetables- sweet potatoes are a great satisfier of a sweet tooth. I would stay away from highly starchy vegetables like white potatoes...and no, corn is not a vegetable- it's a grain. You don't have to give up grains during these 10 days, but if you can hack it- it would be highly beneficial for you! For drink substitutes, try fruit infused waters. Throw some pineapple, lemon, or orange and maybe even some herbs- like mint- into your waters and let sit for a while. My favorite combo is pineapple, ginger, and mint in a big pitcher of water. If you feel like you are about to die, and cannot make it (you may experience withdrawal and die off symptoms (yeast and bacteria dying off) if you are a sugar-aholic like I used to be:) then grab a couple of small raisins or unsweetened other dried fruit. But use that as a last resort! I will be posting some helpful recipes and tips along the way. As someone who used to bake pastries every day for a living, and who recently just went 4 months without ANY sugar except what is naturally in fruit and nuts (even went without dates or dried fruit), I can attest to the fact that it can be done! I will be doing the challenge as well, and so we will be in it together! I asked my husband what we should call this, and he gave me several possibilites. Broccolango. Bracango. Mangoccoli. Then things started getting crazy with the names. He (and his family, it's hereditary :) have a knack for making up silly shortened names for things. For example, he always says "perf" (short for perfect) when he's excited about something. Just a little insight into the crazy silliness I live with every day! Anywho, this simple, colorful summer salad would be a great crowd pleaser at a potluck or a BBQ...whatever you decide to call it. Enjoy! Mix all salad ingredients together in a bowl and make the dressing. (For the dressing) blend all ingredient except the oil in a food processor or high powered blender until well blended. Then slowly drizzle the olive oil into the dressing through the spout (if using a Vitamix no higher than power 7) until fully emulsified. Pour dressing over salad ingredients and let marinade for at least 30 minutes. Season with more salt if desired. Serve immediately or let set in fridge overnight for extra flavor. Last month I started a series called Conversations That Help. I realize that the decision to journey towards health is a big one, with many bumps, changes, frustrations, etc. along the way. After starting out with this post with my friend, Whitney, I heard feedback for the need for more "conversations". Just regular people trying to make better decisions. What was the motivation or inspiration for you wanting to change your own/ your families eating habits? I took a class in college that taught me a lot about healthy eating habits. I started looking at things differently after that class. (For example, I learned that something marketed as "low fat" typically had more sodium or sugar than the full fat version.) I realized from that class that I wanted to be well informed on what I was actually buying at the grocery store. Now several years later, I have 3 young children and I realize that now is the time to get extreme. If I decided "no more sugar" when my children were older it would be much tougher than cutting it out now! Even though it is hard with a full family and a crazy schedule, I decided to make cooking our meals a high priority. What was the first thing you did to take that first step towards a healthier lifestyle? I think the first thing I did was I learned a lot about reading ingredient labels and I set certain standards for our family. If I don't like the ingredients, I don't buy it. What has been the hardest thing to change or hardest part for you so far? Ahh, budgeting and being healthy. Sometimes those two seem like enemies! But you do it with three small kids, to boot. Any budgeting tips for moms? Keep your receipts from different trips to various stores. Take time to compare prices of items you will purchase regularly. Compare notes with friends. Make a list of what to buy where. And grab those coupons in the front of the store at Whole Foods. Keep track of how long an item will last around your house. Especially if it is an item that you buy in bulk or an expensive ingredient (i.e. sea salt, stevia, dates, flax, etc..) Try not to run out of those all in the same week! Cook! I cook ALL the time. We rarely go out to eat. I even try to make most of our dressings and sauces, etc. Cooking is fun, saves money and you know what you are eating! Kids can help too. Caroline (oldest daughter) makes our salads (shreds lettuce, adds veggies, etc.) She always makes hers twice as big as her daddy's! Make that chicken go far! We are BIG eaters, but I have several meals that I can make using just two chicken breast. (Thai curry meal, chicken kabobs w/ lots of veggies in between, chicken fried brown rice, grilled chicken salad etc..) Or cook a whole chicken and eat on it several times. Make your husband learn to hunt. Mine still has not, but my dad knows how. Venison and wild turkey are ideal sources of meat. See if you can find someone to kill for you and pay the processing fee. (Or you could cut it up yourself...) This is a great way to go! Can't find a hunter? Contact a local processor and ask if you can buy any leftover venison. Seriously, it is lean and has the ideal omega ratios. I made venison lettuce wraps last night and we LOVED them. Plant a garden. You can do it. Kids think it is great. Plant peppers, they are expensive and need to be organic. Plant strawberries. I didn't but I should have! This is new to me, but you can make your own cleaning supplies, laundry and dish detergents, etc. It saves money and ensures that the products you use are non-toxic. My mom just started doing this. It will be my next step. There is ALL kinds of info online. I loved that you talked about connecting with farms and hunting...the cheapest way to get good clean meat :) Although, you have to know a hunter...or a farmer. But that is easily fixed! (If you don't, check out Eat Wild, like Ruth Allen suggested, or Local Harvest to see if there is a meat processor or supplier near you.) I also love how you have your daughter involved in the food preparation- even at four years old. Cooking together and preparing meals as a family is such a lost pastime. I hope more are encouraged to do the same with their children. What have been the benefits you have seen along the way from making all of these choices? My children are awesome eaters! We have noticed our pants fit nicely, too. I know a lot of moms wonder about their kids still being good eaters around other kids who eat differently, like "will my child notice they have a healthier lunch?" or "will they want the not-so-healthy snacks that their friends have" etc. How do you typically handle those situations? This is hard. All you have to do is leave the walls of your house and they are bombarded! We go to the pediatrician and what are they handed when we leave? A piece of colored sugar and corn syrup on a stick. It is sad. I'm quite a sucker myself so instead of saying "no thanks, come children let's go home and get some carrots", I just start praying that sucker will fall in the dirt on the way to the car. At home I can control what they eat and teach them what is best for us, so I do. I do the best I can when we are out. I try to have snacks from home with me. As far as lunches go... So far my 4 year old is happy if I let her help pack her lunch. She will tell me what her other friends bring, and we sometimes try to do a healthy version. I always try to make sure her lunch has her favorite healthy things. Right now I just rest in the fact that MOST of the time they are eating well. Anything extra- advice you feel would be helpful for others like you? I asked God to show me how he wants me to feed my family, to give me a plan. There is a lot of info out there, and many decisions to make. (meat or no meat, dairy or no dairy, etc!) God will show you what's right for your family. Thanks for mentioning that about your clarity coming from God in a world of SO MANY health crazes/ options. It is comforting for me to know that I am not as big as He is, and He does help us so much along the way! I think God will honor the fact that we are trying our best to make good choices for the body he gave us. Even if we do get it wrong sometimes, because we will! If you want to share some of your life experience with making healthier choices, please email me at pumpkinspantry (at) gmail (dot) com. Chutney. Weird word. Sometimes I'm also weird and crave sweet with savory. One of my favorite "bad for you" recipes I came up with in my less healthier days is rosemary olive oil pound cake with savory caramel sauce and whipped cream (way too much sugar and refined ingredients- not to mention dairy which I am allergic to - however, I'm still proud enough of that not-so-healthy recipe to show you a pic.....don't worry- it was not taken recently :). *If you aren’t using honey, or replacing with stevia, go ahead and dice the peaches and toss with the lime juice 30 min.-1 hr. beforehand so that the natural sugars of the peaches make some good juice. Serve over chicken, fish, or bread for a good sweet/ savory appetizer. The picture above is on this bread from Roost. I just replaced the eggs with 3 Tbsp chia seeds and 1/3 cup water to make it egg-free. Do you have any sweet/ savory combos that totally float your boat? That's right, fried goodness....well, sort of...more like faux fried goodness! I don't have liquid nitrogen lying around the house, and typically fried ice cream you get at restaurants is frozen way way past the freezing point to temps way below zero. This way when they flash fry it, the ice cream doesn't melt. My "fried" outer coating is not cooked, but uses coconut oil and walnuts for the fried-like taste... so technically this recipe is Faux Fried Ice Cream- but way quicker and much healthier :) You get the corn flake or tempura batter taste with out all the work and the uncooked egg you most likely get in the restaurant version. This particular recipe is a twofer. I was in the mood for a more Asian inspired fried ice cream so I made some green tea ice cream. You can make this with any flavored ice cream at home. Just follow the directions for the assembly below. Also, if you don't want to take the extra time, you can use the green tea ice cream recipe by itself to make green tea milkshakes- ooooh, or even bubble tea if you have some tapioca pearls lying around. Heat ½ cup of the non-dairy milk and the coconut oil in a skillet or pan. Don’t boil- just bareyly scald (160 ° F). Blend the Matcha powder with a small ammount of the non-dairy milk to make a paste to get the clumps out, then add that to the ½ cup milk in the skillet. In a blender, blend the sweetener of choice, the rest of the milk, the cooked green tea/ milk/ coconut oil mixture, and the salt. Freeze according to your ice cream maker’s instructions. Pulse all ingredients in a food processor until crumbly. Spread out onto a plate or tray. Set aside while you finish waiting for your ice cream to freeze. When mostly frozen, scoop out the ice cream onto a parchment lined tray with a large ice cream scooper or a 1 cup-sized measure. If you are using store bought ice cream, or your own- start with this step after you have made the "fried" part and measure out your ice cream onto a parchment lined tray and re-freeze if needed. Freeze the ice cream "domes" until hardened- about 30 minutes - 1 hr. When solid, roll the ice cream dome in the “fried” mixture, pressing it onto the top of the dome with your hands. Re-freeze for about 5-10 minutes before serving so the fried mixture has solidified and is good and stuck onto the ice cream. Enjoy! Happy Un-fried Ice cream making!